Canyons are truly among the greatest natural wonders on Earth. Their rock layers are a great place to find fossils, to study about Earth’s history and, of course, an unbelievable sight to behold. Here the list of 9 most amazing canyons in the world. Nestled between the majestic Jade Dragon snow mountain and Haba mountain, the tiger leaping gorge is one of the deepest canyons in the world. It is located in the Yunnan province of Southwestern China. This 9.3 miles long river canyon has a maximum depth of 3790 meters. This gorge was carved down by the Yangtze river. There is a large rock situated at the narrowest point of this river. According to legend, Once a tiger used to leap across the 25-meter wide river. 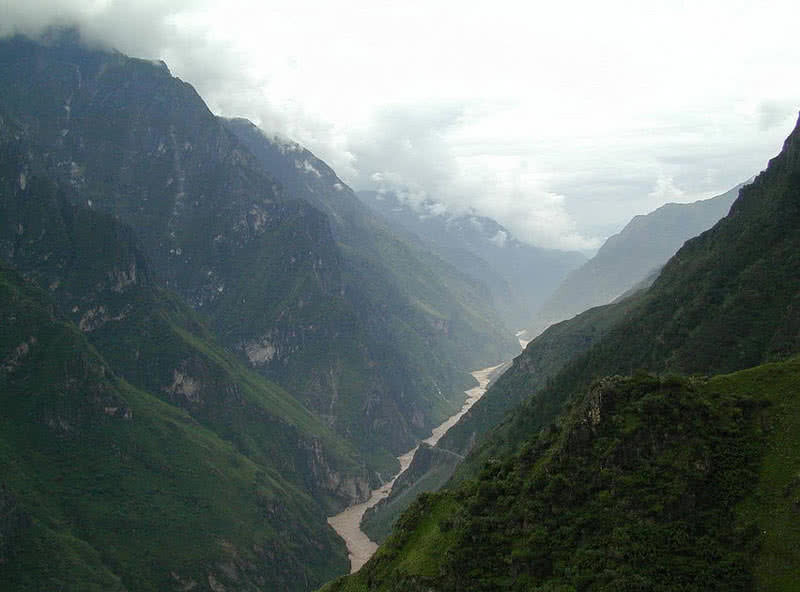 Since then the gorge called as tiger leaping gorge. This amazing gorge is divided into three different sections: upper gorge, middle gorge, and lower gorge. The narrowest part of the gorge is located within the upper gorge and it is known as ‘mouth of the gorge’. In the middle gorge, you will see 100 meters drop of the river. The gorge in the last section is very steep in comparison with other two sections. Apart from the great views, this gorge is one of the best hiking spots in the Yunnan province. 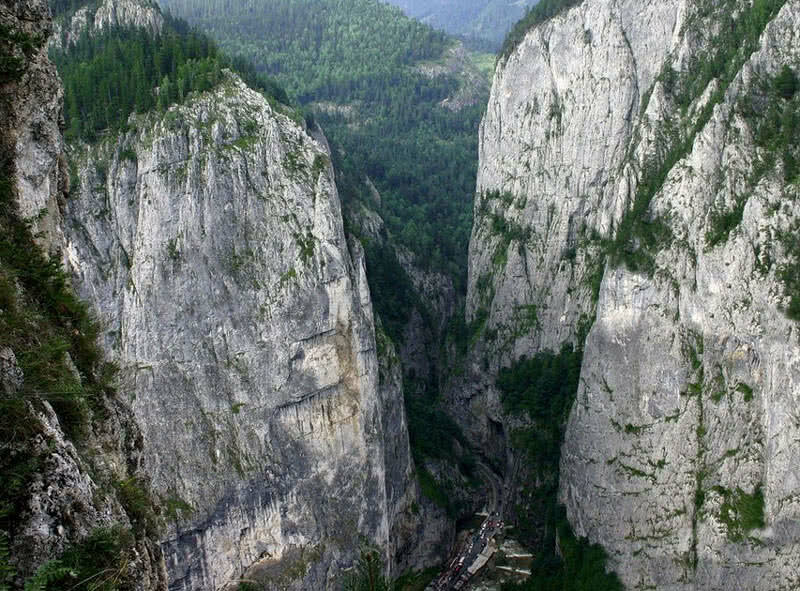 Bicaz canyon is the most spectacular canyon in Romania and a part of Bicazului Gorges National Park located in the Northeastern part of the country. Carved by the waters of Bicaz river, this 6 km long canyon connects Harghita county with the Neamt county of Romania. The narrow road passes through the Bicaz canyon is one of the most scenic road passes in the entire Europe. The Bicaz canyon is surrounded by high Suhardul Mare and Suhardul Mic mountains. The limestone walls of the canyon include a number of amazing caves. The surrounding area also has a number of amazing small gorges created by the tributaries of Bicaz river. Breathtaking Verdon Gorge in Southeastern France is considered to be the most beautiful canyon of Europe. The width of this 15 mile long, 700 meters deep canyon varies between 200 and 1500 meters. This amazing canyon is dates back to Triassic period ( 200-251 million years ago) and the beautiful Verdon river with turquoise green waters flow through it. WIth towering limestone cliffs, deep valleys, and a strikingly colorful river, the Verdon gorge is a paradise for visitors. It is also home to a variety of flora and fauna. Rock climbing is the popular tourist activity in the site. 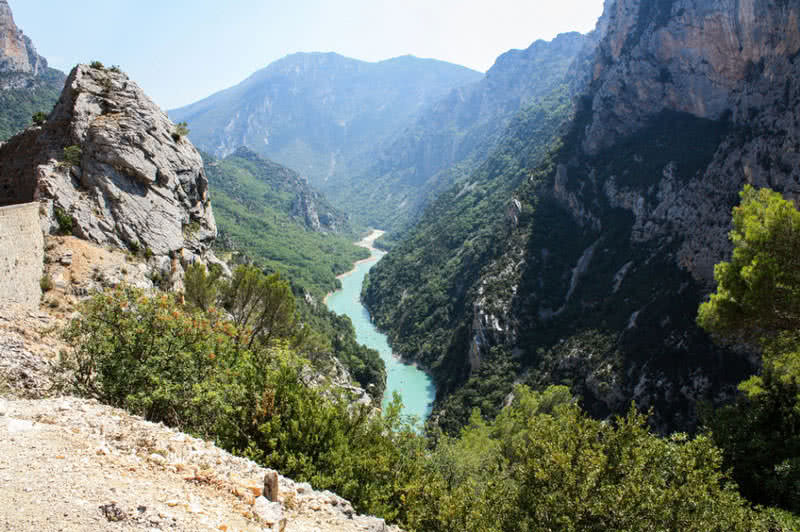 Hiking or drive around the rim offers an unbelievable view of Verdon gorge. You can also enjoy kayaking, rafting, fishing, water skiing and paragliding at the Verdon Gorge. Reaching a maximum depth of 4160 meters, the Colca Canyon is the second deepest canyon in the world. It is located high in the Andes mountain range in Southern Peru. With endless trekking routes, breathtaking views and lots of activities, the Colca canyon is one of top tourist attractions in Peru. You can reach the Colca canyon from the Chivay village in the Colca valley. The hike can be tough, but the views are just stunning. You will see amazing valleys, steep cliffs, a variety of animal and plant species and beautiful colca river. Trekking is the best way to enjoy the deep Colca canyon, twice as deep as Grand Canyon. With an efficient guide, you can enjoy a great trekking in Colca Canyon. This site is also home to rich fauna. Upon them, most famous one is Andean condors, one of the highest-flying birds in the world. They can be seen in Colca canyon throughout the year. 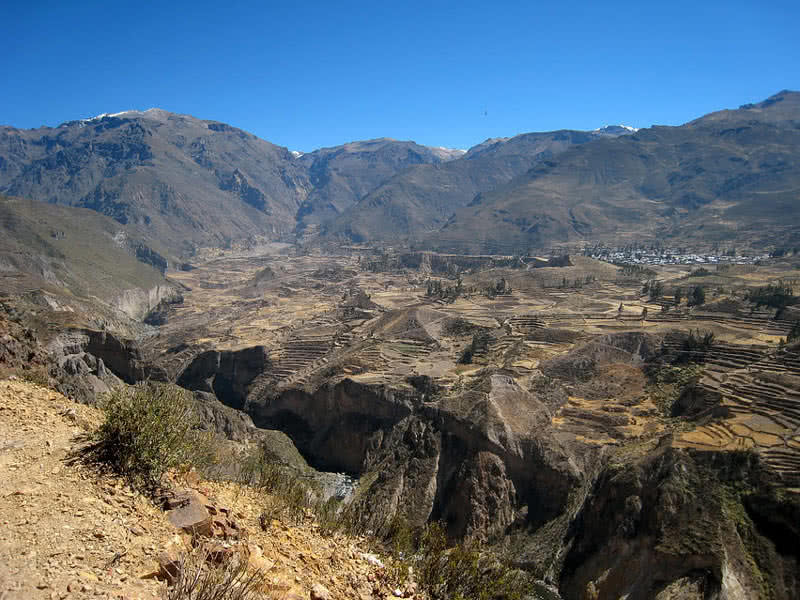 The Colca valley also includes thousands of terraces built by the Incas. 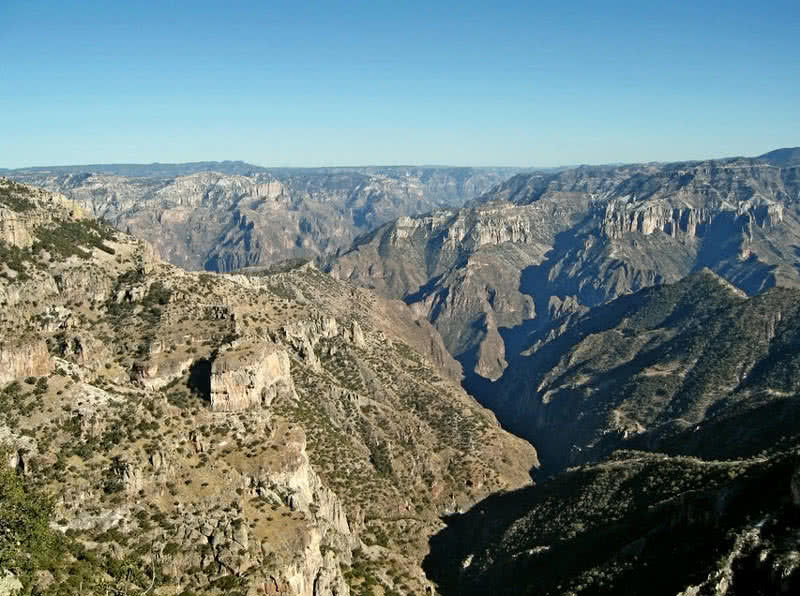 Copper canyon is truly a natural wonder of Mexico located in the Chihuahua State of the country. In fact, it a series of 6 majestic canyons that comprises a total area of 25000 square miles. Copper canyon is deeper than Arizona’s famous Grand Canyon by over 400 feet. The spectacular copper canyon is named after its brilliant copper hue of its walls. Around the canyon, you will see incredible mountain peaks, subtropical forests and beautiful waterfalls. Copper canyon also has wide variety of flora and fauna – features 200 species of oak, 23 species of pines, 290 species of migratory birds, 87 species of reptiles and some of large mammal species like black bear, deer and lion. The amazing Waimea canyon located in the Kauai Island of Hawaii is the largest canyon in the Pacific. It is 14 miles long, over one mile wide and 3600 feet deep. Apart from the great size, the walls of Waimea canyon displays red, copper, purple and gray hues. The beautiful Waimea river with reddish waters also flows through this canyon. This natural wonder of Kauai Island also described as the ‘Grand canyon of the Pacific’. Take a drive along Hawaii route 550 to get an amazing view of the Waimea canyon. There is a number of great viewpoints on his highway. It is also a perfect spot in Hawaii for hiking with best trails. 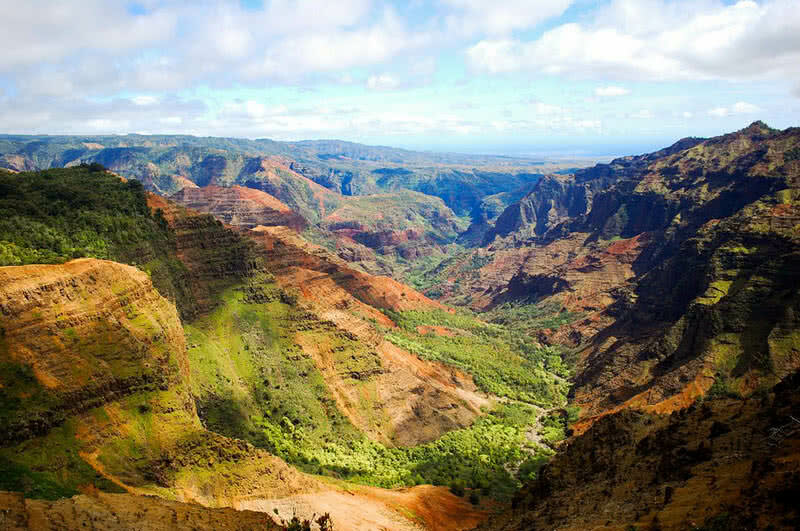 Hike along the rim to enjoy the unbelievable beauty of the Waimea canyon. You can also take a helicopter tour to get a breathtaking view of Waimea canyon from a different perspective. 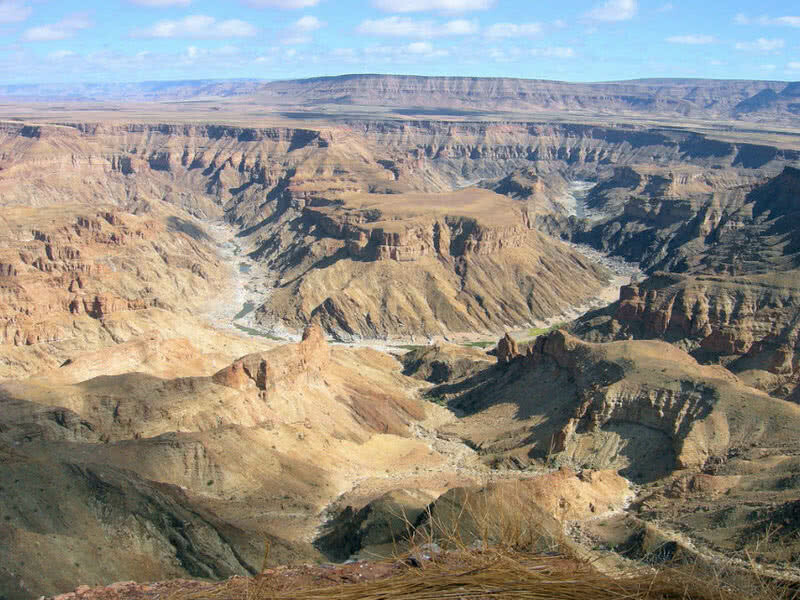 Situated in the Southern Namibia, the amazing Fish River Canyon is the largest canyon in Africa. It is 100 miles long 16 miles wide and 550 meters deep. It was formed by the collapse of a valley due to the movement of Earth’s tectonic plates over 500 million years ago. The longest interior river in Namibia, the fish river also flow through this great canyon. The long fish river that cut through the vast rocky landscape of the canyon is truly a great sight to behold. But keep in mind that it is a seasonal river. In dry seasons, it gets dry out and only flows in rainy season between January and April. The fish river canyon has 52 mile long hiking trails. It is one of the toughest hikes in Africa and it takes 4-5 days for the completion. But the views are just stunning. June to September (when the weather is cool) is the best time for hiking in Fish River Canyon. There is also helicopter service that offer you the bird eye view of startlingly beautiful Fish River Canyon. Unquestionably, the Antelope canyon in Navajo territory of Arizona is the most beautiful slot canyon in the world. Photographers and tourists from around the world flock to this canyon to see its colorful, wavy sandstone walls and narrow passages. Antelope canyon is also the most photographed slot canyon in the world. The Antelope canyon is formed by flash flooding over thousands of years ago. 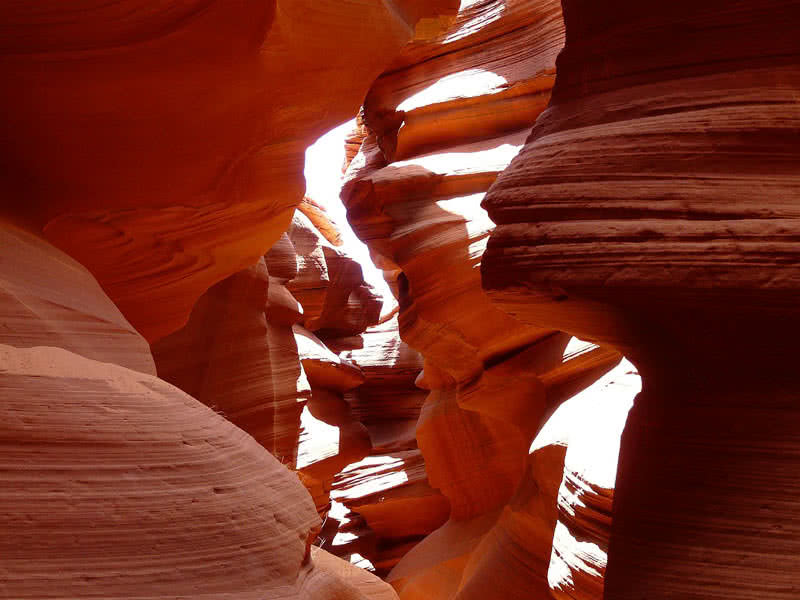 This incredible site actually comprises two different canyons – upper antelope canyon and lower antelope canyon. The upper antelope canyon is the commonly visited part due to the easiness of access. The passing of sunlight through the opening above the canyon is truly a great sight to see. Unlike upper antelope canyon, the lower antelope canyon is quite difficult to access. You need to climb along the metal staircases installed on the walls of the canyon. The passageways of this section is also narrower than the upper part. But the beautiful canyon walls make the lower section worth visiting. Also, keep in mind that the antelope canyon is prone flash flooding in the monsoon season. Grand canyon is neither the largest nor the deepest canyon in the world. Still, no other canyon in the world is as famous as Grand Canyon. It is also considered to be one of the seven natural wonders on Earth. This amazing steep-sided canyon in the U.S State of Arizona is 277 miles long, 18 miles wide and over 6000 feet deep. It is truly one of the most beautiful places you should visit in your lifetime. Grand Canyon was carved by the Colorado river over millions of year ago. The metamorphic rocks found at the bottom of the Grand Canyon is about 2 billion years old. This canyon also features over 230 million years rocks at its upper part. Thus, Grand Canyon can reveal much about Earth’s history. Havasupai falls located in Grand Canyon is among the most beautiful waterfalls in the world. Surrounded by the multicolored cliffs, this amazing waterfall has striking vivid blue colored waters. The pools at the foothills of Havasupai is also great for swimming. Grand Canyon Skywalk (a cantilever bridge) located in the Western part of the canyon offer great panoramic views. It is situated 720 feet above the canyon floor. 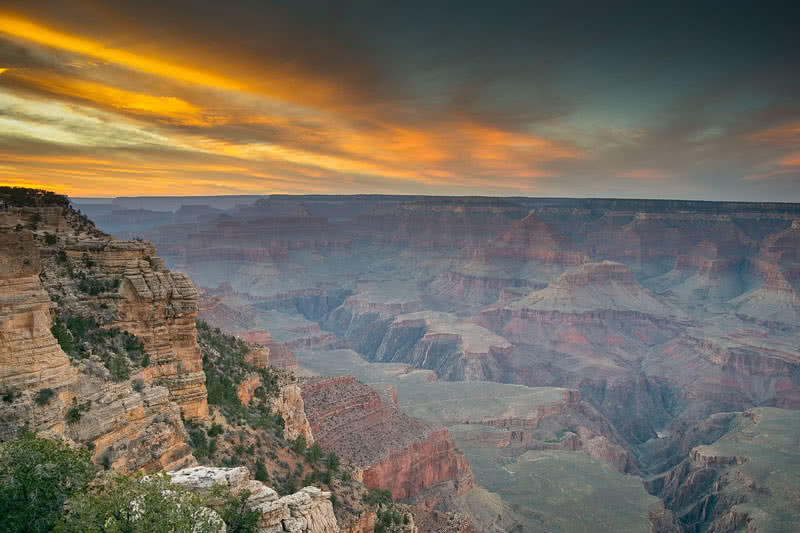 At Sunrises and Sunsets, the vast rocky landscape of Grand Canyon appears in vivid colors. Grand Canyon is also one of finest destination in Arizona for hiking. With permission, you can even enjoy overnight hiking at this wonderful canyon.